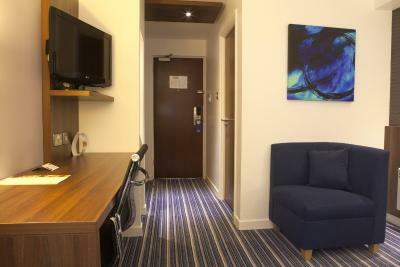 Lock in a great price for Holiday Inn Express Edinburgh Airport – rated 8.4 by recent guests! Free breakfast and very tiny room, convenient shuttle bus for every 15 minutes. Very convenient, clean and the staff were extraordinarily friendly. Everything else as great..especially the hotel desk staff..everything clear and simple..easy arrange for shuttle back to airport etc..
Clean rooms and very friendly staff. Breakfast is included. Flew into Edinburgh airport at last minute for death in family. Was able to get a room with no advance reservation. Staff very friendly and helpful. Room, clean, comfortable and affordable. Perfect if traveling alone. The steak and ale pie dinner was awesome! I was happy they could hold our luggage for us! The breakfast was very good, the room clean but lacking a bath and refrigerator. A good hotel for over night stay but not for a few days. The location was perfect, everything was very clean and comfortable. We were very happy with our choice. It was a perfect choice for what we needed. Everyone was friendly and knowledgeable. Bed very comfortable, room, bed, bathroom, and shower excellent. Breakfast serving from 4 am means you can have breakfast even if you are catching an early flight. Holiday Inn Express Edinburgh Airport This rating is a reflection of how the property compares to the industry standard when it comes to price, facilities and services available. It's based on a self-evaluation by the property. Use this rating to help choose your stay! Next to Edinburgh Airport, the award-winning Holiday Inn Express Edinburgh Airport offers a 24-hour shuttle service at a surcharge, long-stay parking, and rooms with power showers. Central Edinburgh is 15 minutes’ drive away. The rooms at the Holiday Inn Express feature a TV with satellite channels and in-house movies, free WiFi, and a spacious work desk. Rooms also include a hairdryer and tea and coffee making facilities. Wheelchair accessible rooms are available on the ground floor. Free parking is provided for the duration of the stay and the M8/M9 motorway is just 5 minutes' drive from the Holiday Inn Express Edinburgh Airport. Edinburgh Castle and the central shops and attractions of Princes Street are a 15-minute drive from the hotel. When would you like to stay at Holiday Inn Express Edinburgh Airport? A satellite TV with in-house movies, free Wi-Fi access and a spacious work desk are included in this room. With contemporary style, this spacious room includes a work desk, free Wi-Fi, an LCD TV, and in-room pay-per-view movies. It also offers complimentary tea and coffee facilities, a choice of pillows, and a walk-in shower. This spacious and contemporary room includes a work desk, free Wi-Fi, an LCD TV, and in-room pay-per-view movies. It also includes complimentary tea and coffee-making facilities, a choice of pillows, and a walk-in shower. This accessible and contemporary room includes a spacious work desk, free Wi-Fi, an LCD TV, and in-room pay-per-view movies. It also includes complimentary tea and coffee-making facilities, a choice of pillows, and a roll-in shower. This contemporary room provides a spacious work desk, free Wi-Fi, an LCD TV, and in-room pay-per-view movies. It also includes complimentary tea and coffee facilities, a choice of pillows, and a walk-in shower. This accessible, ground-floor room includes a satellite TV with in-house movies, free Wi-Fi access, and a spacious work desk. We are an award-winning hotel that offers long-stay parking and rooms with power showers. Edinburgh’s centre is 15 minutes’ drive away. Our rooms feature TVs with satellite channels and in-house movies, free Wi-Fi, and a spacious workdesk. A hairdryer and tea/coffee facilities are provided. Edinburgh Castle and the central shops and attractions of Princes Street are a 15-minute drive from the hotel. Breakfast, lunch and dinner are served at the hotel's award-winning La Bonne Auberge Brasserie. House Rules Holiday Inn Express Edinburgh Airport takes special requests – add in the next step! Holiday Inn Express Edinburgh Airport accepts these cards and reserves the right to temporarily hold an amount prior to arrival. The airport shuttle service is GPB 2.50 per person. Free overnight parking on site, further long stay parking packages available. Tiny room. Breakfast was quickly picked over and food was not replenished. Check in and check out very quick. Convenient accessible by airport shuttle bus. It is all very clean as we like it. Noting all was in order. The staff were very helpful and the evening meal was good. Room clean and very comforatable. Will be using the hotel the next time we fly out. Beer choices were poor (no IPA) and no hair conditioner provided or available for sale. The room was clean and quiet. The shower was wonderful! Had to take bus, nothing in walking distance. Not a problem, though. They forgot my haggis for my chicken sandwich and I wasn’t aware the bus would would drop me a mile from the hotel. I would possibly like a bit more of a selection, of food for breakfast. The room was very nicely decorated. We had room at back of hotel, so was nice & quiet. I really liked the walk in shower, as i am only 5ft 2, so have difficulty with shower over bath. Staff were very helpful. I feel accommodation, was good value for money.